This 1908 Victorian farmhouse is very private - it sits across the road from the native Pine Kill trout stream and just 2 miles from the Basha Kill nature preserve. There is plenty to do nearby if you like the outdoors (x-country skiing, snowshoeing, hiking, kayaking, birding). The house has a salt water pool (open May through Sept), perennial and herb gardens, country kitchen, steam room, ping pong and a bath for each bedroom. Perfect place to unwind. The master bedroom is downstairs and has a king bed. Also downstairs is a den/family room with sleeping nook and sleeper couch that can sleep a few extras in a pinch. There is a main living room, kitchen and eating area downstairs, as well with sliding doors that open to a back patio/pool area with barbecue and outdoor eating areas. Upstairs are 2 bedrooms and 2 baths. One room has 2 twin beds and bath en suite. The other room has a double bed with bath across the hall. We have a Roku streaming device for hulu, Netflix, etc.. but no cable/tv service. Editor with teenage daughter that lives in NYC during week and Catskills on weekends. It is an extremely relaxing place surrounding by streams, perennial garden and tall pines. There are no neighbors. Completely private. Middle of nowhere yet so much to do! Relax in blue stone patio, swim in pool, watch birds, lie in hammock, read, watch movies, play ping pong, take a walk or bike ride, kayak, go for nature walk at Bashakill where there are bald eagles. Near Bashakill Nature Preserve which has walking/x country ski trails and kayaking/canoeing. Native trout stream on property. Near High Point State Park with trails for hiking/x country and kayaking. View more about Lara S.
Master bedroom has steam shower. Throw open the windows and let the sound of the nearby stream lull you to a sound sleep. You are really in a rustic setting surrounded by fir trees, wildflowers and the promise of wildlife right outside your door. The house is very clean with comfy beds, soft linens, abundant towels and everything we needed in the kitchen. Games, music, pool fun, BBQ, relax, read, unwind and unplug if your so inclined. Lara, the owner is responsive and friendly. When the area temporarily lost power during heavy rain she called the power company to find out details of the outage. We thoroughly enjoyed our stay and would recommend this home to our families and friends. I can't properly explain how wonderful our vacation in early August was as this home. The property is beautiful, well maintained, and exceeded our expectations. It's located in a remote area but close enough to businesses should you have any needs. 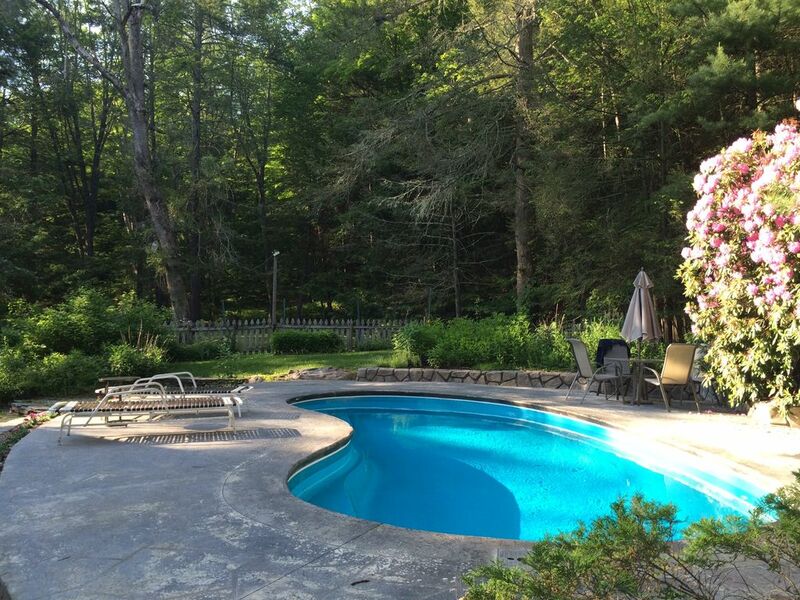 The pool - the main reason we chose this house - was perfect and just the right temperature. The beds were comfortable and we were thankful for the room fans that were provided. The kitchen was well stocked for cooking needs. We have Verizon cell service and had no problem using it. The home internet worked well and it was nice to have access to using the smart TV downstairs to watch movies when it was raining. Also, the owner is very responsive, kind and helpful. These are just a few of the highlights of the property. Not only would I recommend this property to others, I would definitely love to rent this property again in the future. Charming country home in the mountains! Great property and this was our 2nd time to stay at this property. The owner is very responsive and accommodating. We will stay here again upon on next visit to the Catskills. Great vineyard 3 miles from the property we found and fell in love with!! We spent a very peaceful week at this house. A nice secluded site, on a quiet road. Overall we enjoyed our stay 'tho the property did need a couple of minor repairs. The pocket door closing off the master bedroom from the rest of the house needs some adjusting as we could not fully close it and the upstairs porch that serves as a bedroom needs window shades, curtains or the like to filter out the morning sun. The kitchen and laundry were top notch and the walk in steam shower off the master bedroom was great. Well stocked with games for the kids and the pool was refreshing. - Pool and patio ideal for hanging out with a group of friends. - Small but well-equipped country kitchen including excellent selection of pots/pans and appliances. - Master suite with private bath and steamroom. - Plenty of relaxing spaces to hang out, sit in front of the fire, or work. - Fantastic, responsive owner who made the whole experience easy and positive. Located in Westbrookville, NY, home to the Bashakill Preserve (thebashakill.org) in the Shawangunk Ridge basin. 12 miles north of Port Jervis, 8 miles south of Wurtsboro and 20 miles south of Ellenville, NY. 15 miles from Middletown, NY. This house is truly away from it all but not too far from plenty to do.